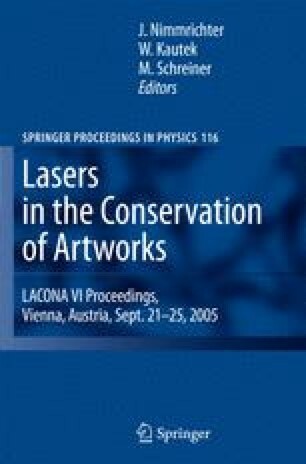 The present work focuses on the main phenomenological features of stone cleaning by lasers. They are the removal rate, degree of cleaning, and chromatic appearance of the treated surface associated with different conservation problems and laser parameters. A set of three different outdoor stone conservation problems were investigated here. The measurement of the ablation rates were carried out on encrusted stone artefacts and two sets of prepared samples in order to derive general behaviour through repeatable measurements. The analysis of the irradiation tests provided a quantification of the different efficiencies, degree of cleaning, and chromatic appearances associated with the fundamental harmonic of Q-switching, long Q-switching, and short free running Nd:YAG lasers (1,064 nm), as well as with the second harmonic of Q-switching sources (532 nm).